The NBA is inching closer and closer to NFL territory where the nonstop drama and intrigue is a 24/7/365 endeavor. Even in the doldrums of the preseason, we have the made-for-TV Jimmy Butler saga playing out in Minnesota and a number of storylines percolating as the season approaches. Of course, no storyline is as significant as LeBron James’ debut for the Los Angeles Lakers. It’s still weird seeing him suiting up for the purple and gold instead of the wine and gold, but there must be a lot of curious basketball fans out there who can’t wait to check it out. How do we know that? Because ESPN set a ratings record for Wednesday night’s Warriors-Lakers preseason game. That’s right, preseason. NBA PRESEASON. Normally, preseason basketball is about as fun as watching paint dry or even worse, First Take. But when it comes to LeBron’s new crew going up against his arch nemesis in the Warriors, even the preseason can become mildly interesting. 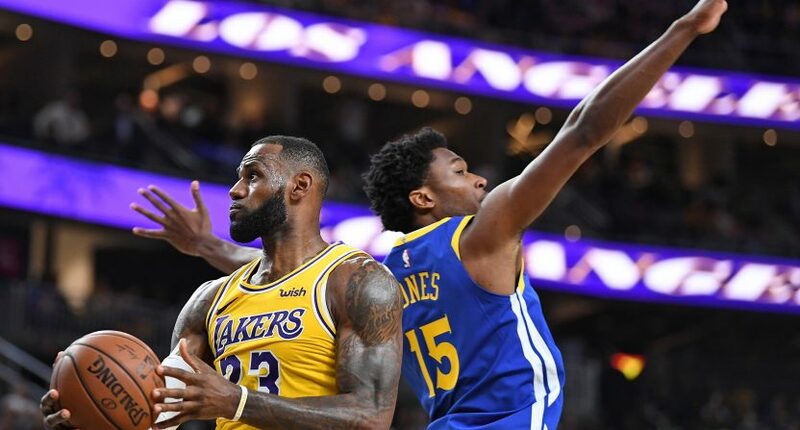 Wednesday night’s matchup between the defending NBA Champion Golden State Warriors and the Los Angeles Lakers delivered a 1.6 metered market rating, making it ESPN’s highest-rated NBA preseason game ever, according to Nielsen. The telecast peaked with a 1.9 rating on ESPN from 11:30-11:45 p.m. ET. The 1.6 metered market rating tops ESPN’s previous record for an NBA preseason game telecast – a 1.1 rating, which most recently occurred for a Cleveland Cavaliers vs. Chicago Bulls game last year. Last night’s rating was up 129 percent from last preseason’s comparable game between the Houston Rockets and the Memphis Grizzlies, which drew a 0.7 rating. Last night’s game generated a 6.2 rating in the San Francisco/Oakland market, while it drew a 3.5 rating in the Los Angeles market. The remaining top markets included Las Vegas (3.3), Birmingham (2.6) and New Orleans (2.6). We’ve had to suffer through way too many Lakers games on national television between the Kobe and LeBron era while they were stuck in the cellar of the Western Conference. Now that you combine that brand with LeBron’s starpower, suddenly they’re going to be one of the biggest draws in sports once again. And those matchups against the Warriors and the other powers out west are going to do great numbers throughout the season. If anything, LeBron’s move to the Lakers at least removes some of the formalities of the last four years when we could pretty much pencil in Cavs-Warriors and what happened from October-May was rather perfunctory. Now there’s a ton of fresh matchups all over the league that will be worth marking on your calendars in the lead-up to the playoffs. While preseason ratings don’t really amount to anything of great significance in the grand scheme of things, this has to be a big indication of what’s to come for the regular season for the NBA and ESPN/Turner.